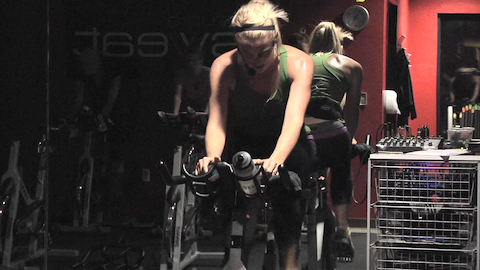 Fat-Torching 30 Minute Spin Class Online! - "Sweating to the Beat"
MM2019 Awesome class, thanks Bethany! Sweaty heart pumping workout. Sprints and heavy and flat roads took my breath away. Great use of 30 minutes in this class !!! Wish the Myzone HR’s were on screen to track with mine…. By far my favorite spinning coach!!!!!!!! Did this class today— Awesome sweat! Thank you Bethany!!! Your classes are great! They always challenge me!! NYOC2019 LOVE THIS WORKOUT! THANKS BETHANY!!! NYOC2019. Love everything about this workout! HW2019 #5 – fun work out! HW2019 #2 – double day! HW2019 thx for the wake up! Hw2019 loved the hill to endurance. So good. Thanks for pedal speed cadence info. Much easier to push myself! MMCF2018 #11. Awesome way to get back in the saddle after a few rest days. Great class Bethany! MMC2018!!! #12/12 Great class! I’m soaked. Drive to 25 2018 #29 one of the best spin/ soundtrack combos ever!! Drive to 25 #22 – I love the music in this…makes the class fly by! Drive to 25 #22 – Great ride! Drive to 25 #16. Great interval drills. Drive 25 (18) not taken a Bethany class for us some time ! It’s always brutal ! Drive to 25 14/25: really enjoyed the music and cardio/endurance drills! Thx! Drive to 25 2018. Great class and music. Soaked! Drive to 25 #8 Great spin as always Bethany! Thanks!! SFL2018 Buckets of sweat! Wow! That was a lot of work in a short class! Bethany never disappoints! Thanks for a great class! SFL2018 #10 I love it when you revisit a class and notice a big improvement in your fitness. I could (nearly) go as fast as the speed demon Bethany and really pushed myself hard. Thanks B – great class! I like Bethany’s style of leading a class. Some instructors use timed cues and even put a clock on the table which just makes me stare at the clock the whole time gauging how long until the class is over. Bethany uses the music cues and clearly has put a lot of work into her classes. I never saw her count down once. She just knew the transitions that well. This one is going in the favorites. 14MDM- 1st ride of the 14 Day Challenge. This class made waking up at 4:45 worth it! great cass with great music! Wow Bethany!! I didn’t know how this would go after waking up early and working all day…it was tough, but I did it and I feel awesome! Thanks Bethany, I loved this workout. PPS…shout out to Heather from Canada! She rocked it! Double Bethany day, paired this with her Ab & Core from 1/22/15. Thanks for the great classes, Bethany! MM2018 #7- I picked this one because I was short on time…. definitely not short on work though! I’m drenched!!! Killer Class Bethany!! Amazing! My goal is for one day to be able to keep up with Bethany’s legs! MM2018 #21 (triple day part 2) buckets of sweat here, too! I’m a happy sweaty mess!!! Nice endurance builder. MM2018! #4 in the books! MM2018 workout #3 – great leg burn! MM2018 2 of 12, I’m a sweaty mess! Hell week 2018 #3! Great class, I’m a sweaty mess!! #Hell Week# Day 5 332 Cals 115 Meps .. great workout! Hell Week! Great workout to sneak in in the mornings before work! Hell week #2. Double day complete!!! Hell Week – I’ll give you a Wooo! That was tough, especially the sprint to endurance. Great ride, thanks, Bethany! Hell Week — first one down, five more to go. Thanks Bethany. Hell Week!!! Class 1! Great ride Bethany!! Thanks!! Love ALL your classes and music!! Few! I made it! I’ve been so sick this week. I tried to do this 2 days ago and my body said No. Sometimes you gotta listen to your body. I’m still not a 100% but well enough to sweat this illness out. This was a good one for me today. So glad to have different workouts to go with how the body feels. Thanks Bethany. Great sweat this morning Bethany-thank you! “Drive to25” – #89..Ouch Bethany..who would have thought that in 30 mins you could burn so much calories and get a great sweat on..this class achieves that and more..loved it again..you’re awe-some.!! Cheers. 27/25. Great class to warm up to a longer workout. Drive to 25 – your classes just get better n better. Loved the sprint endurance ride at the end! “Drive to25” – # 37..Wow Bethany that the third time I’ve done this Class and each time I swear it gets harder.especially those sprint/ climbs for 30..so why do I keep coming back..because I LOVE IT.!! Cheers. Great leg burner, music, and instructor! Drive to 25! Drive to 25–great class! Quick and sweaty! Thanks, Bethany! Drive to 25 #18 just remembered why I put this on my favorite list, awesome sweaty class. Drive to 25 – thanks Bethany! Drive to 25! Loved the drills. Intense workout! Drive to 25 great one Bethany! Love sweating to the beat. Endurance to sprints are the hardest!!! Thank you! Drive to 25! Love working out with my sweaty friend, Heather! Thanks Bethany. Great work out. Love it. Bethany, i love this class! i have done it at leasr 10times lol…my recovery/endurance pace is at 80-85rpm… is that still okay for the sprints set. Bethany, thanks for the sweat! Love your style of spin. I am new to SSOD but I will be looking for your classes! I think was so concerned with keeping my heart rate below 95% and my shoulders ‘quiet’ to make Master Mike proud that it looks like I am not even trying. No problems with that at home – sweat everywhere and heart rate in the red. Great endurance workout. Really enjoyed. Mm2017. Nice one, good music! MM2017- this is gem of a class. Awesome sweat! MM2017 Did this one on Tuesday but forgot to post! Loved doing this one live, just as fun on ‘replay’. MM2017- second of 2 speed spins. AJ and Bethany combined make a great hour of riding! Day 2of the Challenge. Today is going to consist of cardio and stretching. Cardio done now on to stretching. Hi Bethany, My first on line spin class and it was great! You are very motivating …. I’ve only ever taken at a gym and was very hesitant about on line. I honestly felt like I was right there with you. Great 30 minute Spin!! Love this workout! On my FAVS! 💕 Diana H.
Awesome workout!!!! I’ll be doing this one again and again and again!!!! Thank you!!! Enjoyed the workout, Bethany, thank you! Great ride. The at home buffering added 6 min to ride. I pushed thru! Great class! Fun music and a super sweaty workout! Five minutes of endurance/sprints was killer! Love it! Thanks, Bethany! That was a great workout! The sprint/endurance combo was killer!! Thanks Bethany!! Thank you, that is one of my favorite combos!! Glad you enjoyed it as well! No holding back from the start. You got us working hard with the stand up and slide back work. I enjoyed the speed work and dropping back to 90RPM’s. A very solid ride. Thanks! Thanks Dennis, I am glad you enjoyed it! Thank you Krissy! I am glad you enjoyed it! Wow! added straight to favorites! Sweaty mess and those sprint/intervals were tough! Thanks Bethany! Eeeck….thank you Joy! I am glad you loved it! Really good class for a time crunch! Totally! I would rather get in an intense 30 min than nothing at all! Oh yes, way to get it done!! Ha ha ha, right!! I was a bit nasty myself! Way to push it! My old gym called me yesterday – I was so kind I never mentioned how AWESOME YOU GUYS ARE. 1140KM down since I joined, even with bronchitis in the middle. keep on trying to melt us. Yea Judi, keep melting! I am sure that feels AMAZING!!! Going straight to FAVORITES !!! Thanks Bethany! That was a tough one! Great job!! Thank you & good job to you as well! Now that is a KILLER 30 minute spin. LOVED IT. Thank you so much, I am glad you loved it! Cute picture too! Awesome Bethany….great workout after taking a week off to play Grandma with the 2 boys in Denver. All though it was not much of a rest with a 2 year old and a 7 month old. But it was good to get back on the bike. Good for you for spending good quality time with them, I am sure they loved it! Its a different busy with little ones! Glad you are back at it!! Yahoo!!! Great ride Bethany! Just as good as doing it live! Hey Lauren, I am glad you liked it! I bet you can only get about 30 min in before you cutie in the picture needs you again! Great job getting it in & done! Yep, just the last 3 songs are in the saddle. Feel free though to stand if you need to. I like being in the saddle! Great job! One of my new favs! Sweating HARD in that 30 min! Those sprint –> active recovery are brutal, but so good for fitness! Loved it Bethany!! Super sweaty and feeling great – and the music was fantastic. Thank you!! Thank you Doria…I was drippin right there with ya! Hey Terry, same for me! I had a month plus off for recovery! I have worked my can off to get back & its OH SO GOOD to be back! Glad you are back too! Wow Bethany..this was just as tough as it was doing it ‘live’..saved in Favourites..to tackle again and again..love it..and great job Heather!! Wow…you have done it twice already! Crazy man!! 🙂 Glad you enjoyed it both times! Finally got to ride this gem with you and the fearless and fierce Heather L! Sprint/endurance combos are the hardest drill for me but I can feel myself getting stronger every month on them. Me vs me! Hey Heather!! Yes I love those sprint endurance combos! I agree, takes that fitness level to new levels! Way to push it! Yes, Sue…perfect amount of workout for when you are pinched for time or after work! Thanks for joining me! Great workout Bethany! Very sweaty and I loved the music – great job! Thank you Mary, I am so glad you loved it! Mmc2018 (13) this spin class gets me every time, brutal sweat fest ! Hey hey SWEAT Peeps! 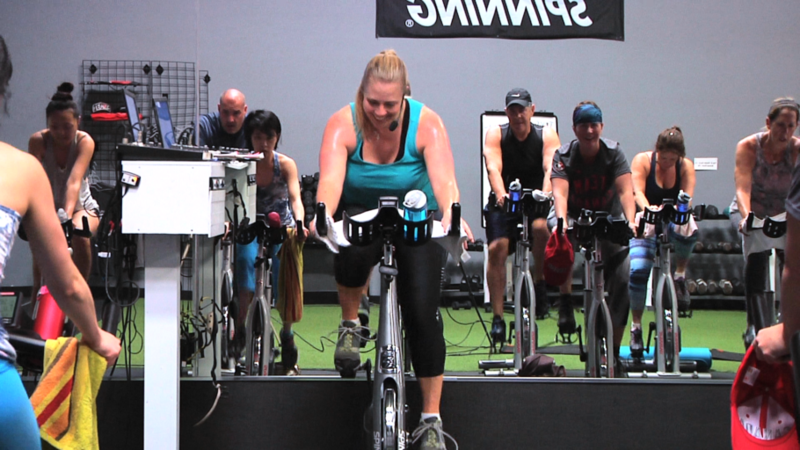 Get ready for an awesome StraightUpSPIN® packed with cardio drenching intervals, sprints and climbs! Don’t miss out on the “show that body some love” stretching at the end! Burn, Build, Stretch, Breathe. Excellent. 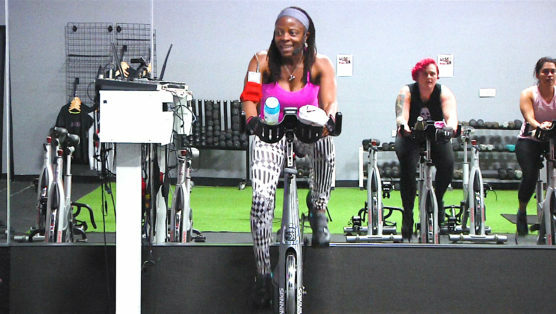 Master Studio SWEAT Cycling Instructor Brooke takes you through a killer ride in 30 minutes that’ll leave your legs screamin’ while your mind and body feel invigorated and energized. You’re going to like it so much that some of you die-hards may even hit play a second time to ride for 60. It’s like when you plan a long weekend get away, but then decide to stay one extra day, and that day is the best day of all! So grab a water bottle and bring your A-game. See you at the finish line! Awesome 22 Minute Cardio & Core Workout! 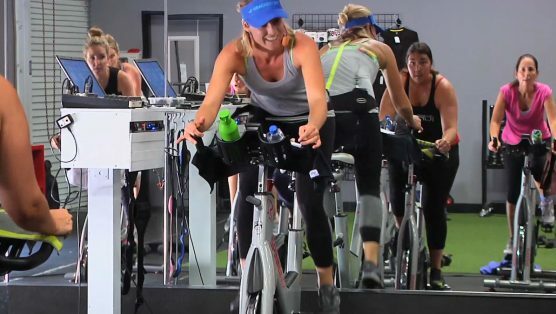 Either grab a Jump Rope or hop on a Spinning bike and get ready to break a sweat, burns some KCALS, and firm up that core, all in just over 20 minutes. If you choose the jump rope for your cardio, skip along with Brian! If you want to ride instead, just follow Cat. Either way, you’re gonna get it done and have some fun.